Carina Gaspar takes on Elsinore in her clown-based reimagining of Shakespeare’s Hamlet. In the spirit of Rosencrantz and Guildenstern Are Dead (with fewer verbal fireworks and more physical exertion), Gaspar zeroes in on minor characters from the original play and pushes them centre stage, re-orienting the tragedy of the original to reveal comic underpinnings. In this case, our unexpected protagonists are the pontificating gravedigger whom Hamlet famously encounters towards the end of the play, and the skull of the corpse he is burying – Yorik. 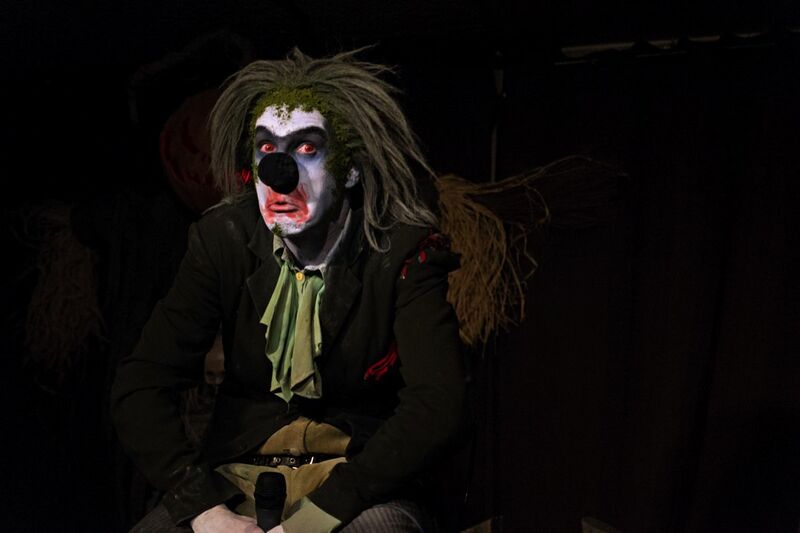 In the original text the gravedigger is himself referred to simply as “Clown”, and Gaspar takes that as a cue to shift Shakespeare’s story from existential tragedy to existential clown show. At the top of the show, having delivered an introduction that merges, somewhat, the plot of Hamlet with the template of the prologue from Romeo and Juliet, Gaspar establishes her universe as a meeting point of various Shakespearean influences – – she recites snatches of various Hamlet characters’ famous speeches, while making references to other works as well. As a framework for a clown re-imagining of Shakespeare this has a lot of potential, a chaotic merging of Shakespearean allusions all experienced by a harried and over imaginative side character. Too often however Gaspar and director Pola Stankovic pursue comic avenues that are left underdeveloped, relying a little too much on Gaspar’s (considerable) charisma to overcome sequences (running away from the ghost of Hamlet’s father; getting stuck in a cape that emerges unexpectedly out of a thermos; conversing with Yorick) that just don’t gain enough traction to take off with an audience. Some of this can probably be put down to first performance issues: now that Gaspar has performed once in the Annex Theatre space to a large group of spectators she likely has a better read of how to send more of her considerable energy outwards in such a spacious area. Her occasional improvisations with the audience were a for the most part a highlight (though an attempt at group rap causes some confusion), and could definitely be expanded upon as the run continues. Some of it, however, comes down to a show that doesn’t seem to have a strong sense of what it wants to do: does it want to be a more introspective piece of clown work or something that gains comic momentum? It doesn’t exactly have to pick one or the other, but as it stands the piece could do with a little more polish; as it stands it often feels like Gaspar is attempting to broadcast character and story beats that aren’t entirely clear. Still, her talent is obvious and the ambition of the piece to act as a nexus for multiple Shakespearean influences is commendable, and I’m very interested to see where she and Stankovic take their idea. This was my first experience with a show starring the zombie clown Jean-Paul Mullét, a 290 year-old undead clown/aspiring Toronto actor whom actor/writer Allan Turner has been inhabiting for several years now. In his latest adventure, Mullét is still struggling to find acting work whilst moonlighting as a waiter at Harbord House, where the audience is assembled. The actor is impressively committed to his character, an enthusiastic but awkward manchild (killed at age twenty-one and seemingly stuck at that age) with the hair and skin tone of Beetlejuice, who both endears and alienates himself in his attempts to make friends and feel comfortable in his decomposing skin. He clomps around the dining area, bemoaning his failed career, reciting monologues and dealing with an overbearing boss (an offstage voice also played by Turner), all the while managing to serve only one dish, a salad, which sadly nobody ordered. I have to confess that I found the humour in this opening section to be pretty cheesy (Mullét at one point delivers a monologue from something called “The Guns of Toblerone”), and there seems to be room for much more improvisation than actually happens, particularly for a clown show set amongst spectators in a restaurant. Happily, the show finds its footing in the second half with the surprise appearance of a woman from Mullét’s past, played with fabulously giddy charm by Hilary June Hart. The two play off of each other well, their ghostly appearances clashing quirkily with their upbeat, gawky affection for one another. Director Bruce Hunter handles their movements through the crowded restaurant space with ease. The makeup and costuming for both performers is also very good, especially when placed against the comparatively normal Harbord House setting – – Mullét’s wig and makeup are wonderfully detailed (the algae congealing around his hair line is a sly touch). Hart’s corpse bride meanwhile is a great creation, her skeletal makeup and tattered wedding gown giving her a tragically menacing air which nicely counters her infectious glee. Turner and Andrea Ouellette (who designed Hart’s dress) deserve especial kudos for their makeup and costume work. Graham Clark’s solo show is a light and breezy forty-five minutes where he takes us through funny pictures on his Instagram account. That’s it. In less charismatic hands this could obviously be a deadly conceit, but Clarke is a talented and enjoyable performer, immediately establishing a laid back repartee with his audience that makes the ensuing slideshow presentation more amusing than it has the right to be. We begin with his very first post, a vintage shot of Mr. T and Hulk Hogan engaged in a very serious interview with a reporter, and goes on from there. I could describe some of the pictures, but there’s no point in doing so if you intend to see the show, and even if you don’t, you can just check out his actual Instagram account, whose handle I won’t give because I imagine he’d prefer that you attend the show first (it’s a very funny handle). I cannot emphasize enough that this show is simply forty-five minutes of Clark giving us a live commentary on his Instagram account. Like, I don’t really know what else to say except that it was often much funnier than I anticipated and Clarke is an undeniably charismatic and sharp performer. While many of his jokes are likely pre-planned, he never feels scripted or overly rehearsed, and he shows off just how quick he can be at the end of the show when he flicks through the accounts of willing audience members. While I occasionally felt myself tuning out as we reached the thirty-minute mark, Clark himself commented that someone had told him the show lags around the middle section and so set off on a nonsense story about coming up with a bizarre sitcom premise about failed witches to re-focus us. This was also funny. There’s a grade on this review but I don’t know if it means anything. If you’re looking for good standup at Fringe, this is a sure bet. If your Fringe show scores an A+ or A, you can cash in on that goodwill with a 50% discount on advertising your show (this one or the next one) on My Entertainment World. If you scored an A- or B+, we’ll knock 25% off the ad price. Discounts also apply to all past MyTheatre Award winners (50% off), and nominees (25% off) in Toronto, Boston or New York. Email us for details.